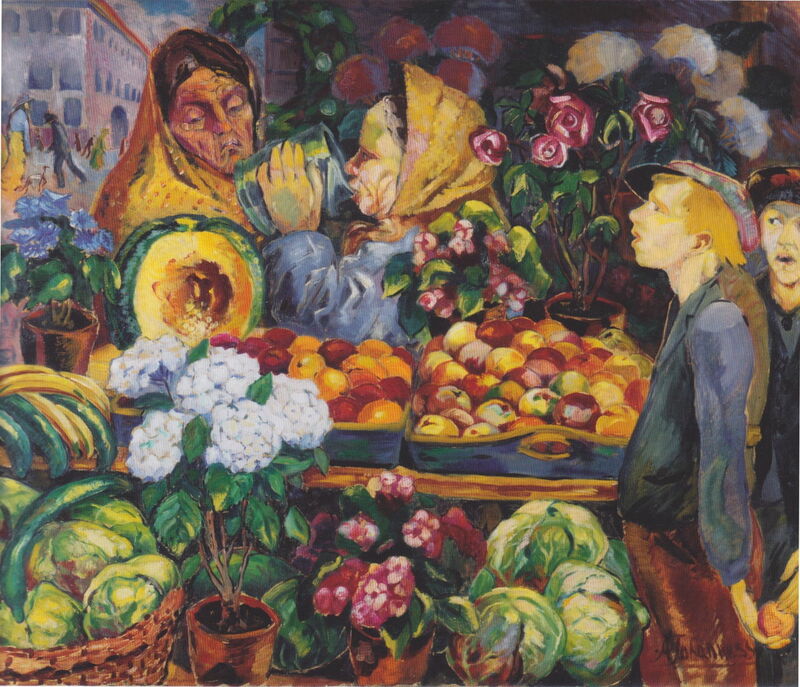 Aksel Waldemar Johannessen (1880–1922), Market Scene (c 1916), oil on canvas, 118 × 148 cm, Private collection. Wikimedia Commons. Following the rather sudden death of the artist the previous autumn, a retrospective exhibition of his paintings at the leading gallery in Oslo was a huge success. Edvard Munch himself praised the works with the words “no finer works are being painted today”. His widow was already dying of cancer, and when the exhibition closed, those ninety paintings went into storage. None was seen again for the next sixty-seven years. It’s only since 1990, and thanks largely to the work of Haakon Mehren, that the moving paintings of the Norwegian Aksel Waldemar Johannessen (1880–1922) have been rediscovered. Johannessen was born in Oslo, Norway, on 26 October 1880, in one of its poorer districts. He wanted to be a sculptor, and by 1900 had worked in the furniture industry and was attending the Academy of Art and Design, where he mainly studied under the sculptor Lars Utne. Over the next seven years, he exhibited at the autumn exhibition of sculpture, but failed to attract attention with his work. Aksel Waldemar Johannessen (1880–1922), Self-portrait (1905), oil on canvas, 84 × 72 cm, Private collection. Wikimedia Commons. 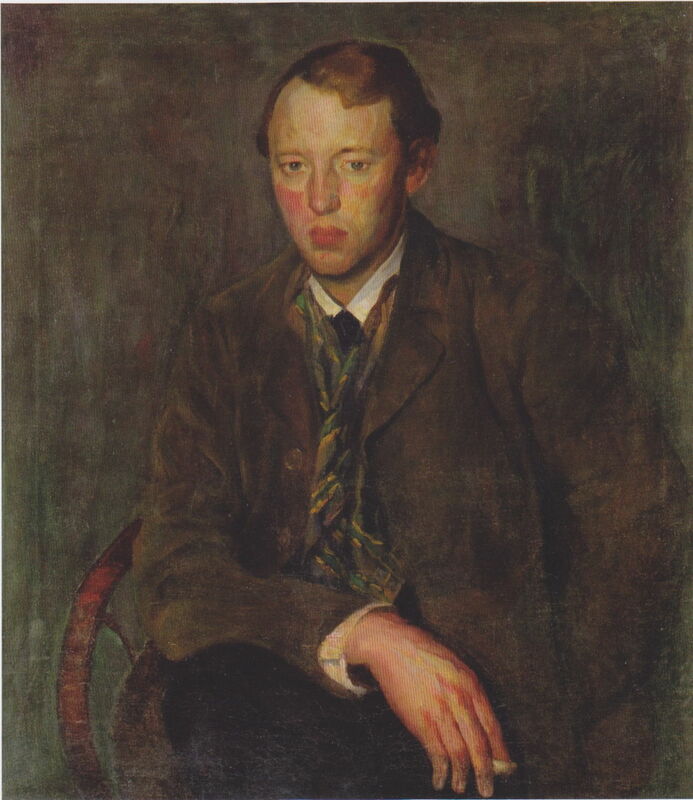 He seems also to have started painting at that time, and this Self-portrait is claimed to date from 1905, while he was still struggling to establish himself as a sculptor. If the date is accurate, it indicates that his painting skills were already advanced well before his other surviving work was made. He married Anna Gjermine Nilsen (1879-1923) in 1907, and the couple moved to Gjøvik, a small town in central southern Norway, where he was able to get work in a local furniture factory making their models. Then in 1911, he decided to try to establish himself as a painter, so the couple moved back to Oslo. There, Anna started running a textile workshop. Aksel Waldemar Johannessen (1880–1922), Man on a Diving Board (1912), oil on canvas, 180 × 89 cm, Private collection. Wikimedia Commons. Man on a Diving Board from 1912 is, apart from the self-portrait above, Johannessen’s earliest surviving painting, I understand, and one of his most visually startling. A well-muscled man in bathing trunks bends forward as he sits on the end of a diving board. Below him, just under the surface of the water, is a young woman wearing a bright red costume, including a hat. This is a remarkably modern motif, and anticipated swimming pool motifs from much later in the twentieth century. In Oslo, Johannessen avoided associating with other painters, who he felt remained aloof and exclusive, but had more literary and humanist friends, including the sculptor Trygve Thorsen, who acted as a model for some of Johannessen’s paintings. Johannessen and his wife were actively involved in the design of ‘bunader’, Norwegian folk costume, and in the theatre, with the newly-formed Det Norske Teatret. In 1912, the couple founded Heimen Husflid, specialist costumiers, which continues to trade today from central Oslo. Aksel Waldemar Johannessen (1880–1922), Mother and Children (diptych) (1915), oil on canvas, 180 x 97 cm, Private collection. Wikimedia Commons. Johannessen’s diptych of Mother and Children from 1915 appears quite innocent, but a closer reading is more sinister. In the left panel, a young woman, modelled by the artist’s wife, stands in a park at night. She is a prostitute waiting for a customer, and the two suspicious-looking men in the distance are pimps keeping a watch over her. In the right panel, her children are at home, tucked up in bed, waiting for her to return from her night’s work. Two girls cuddle together in bed, while her son looks out of a window at the starry night. An empty plate and an old shoe establish their poor status, in spite of their mother’s smart working clothes. 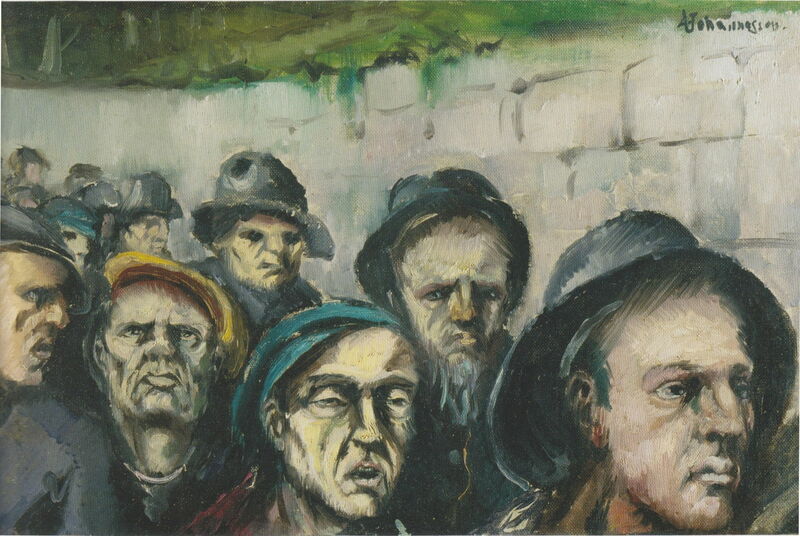 Aksel Waldemar Johannessen (1880–1922), Workers (c 1915), oil on canvas, 30 × 48 cm, Private collection. Wikimedia Commons. In Workers from about 1915, a stream of working men are making their way through a cutting below a wood, as they walk to work. Their faces say it all: drawn, haggard, half asleep, and agonised. The artist painted his self-portrait for the man at the right. 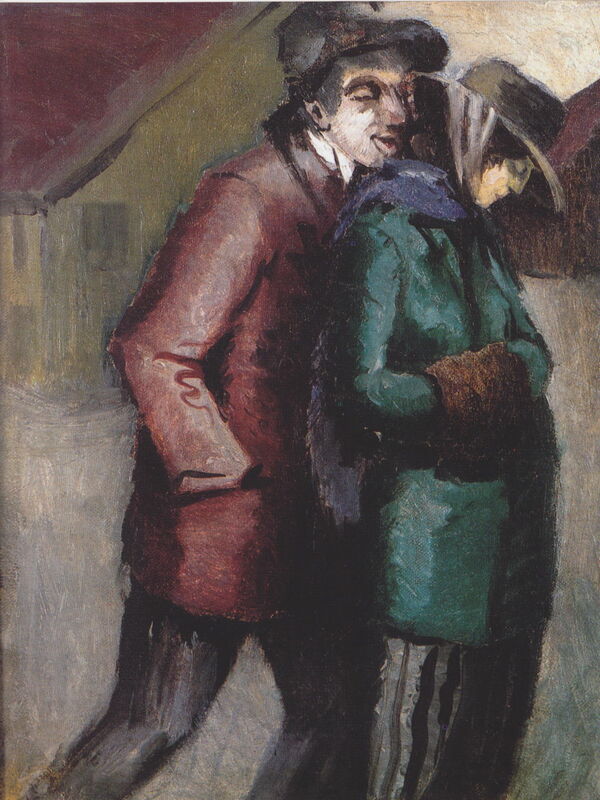 Aksel Waldemar Johannessen (1880–1922), Forced into Prostitution (1915), oil on canvas, 41 × 31 cm, Private collection. Wikimedia Commons. 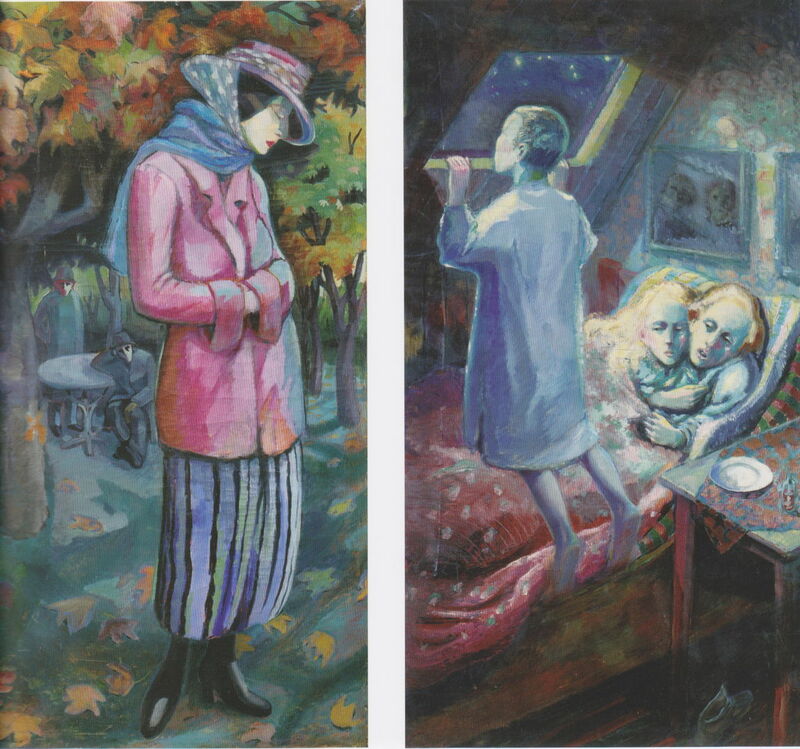 Forced into Prostitution, also known as Night Wanderer, from 1915, shows Anna Johannessen in a very similar pose and role to that in the diptych above. Here an odious-looking client with bushy eyebrows and a thick-set face is pressing against her from behind, wanting to pick her up. Aksel Waldemar Johannessen (1880–1922), The Gravedigger (1915), oil on canvas, 74 × 55 cm, Private collection. Wikimedia Commons. 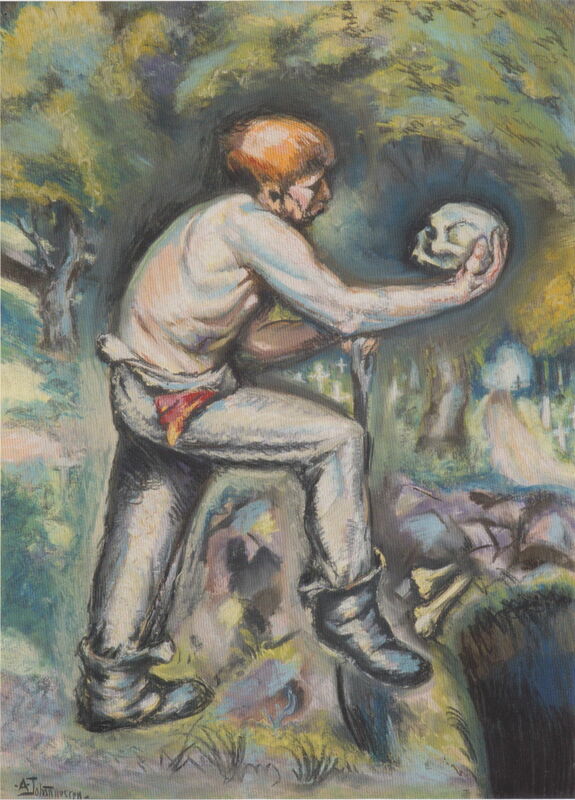 I suspect that Johannessen’s The Gravedigger (1915) was inspired, at least in part, by the famous grave-diggers scene from Hamlet, in which Hamlet laments the death of Yorick, his friend, while holding a skull. In the distance is an ethereal light which may represent a ghost or spirit. By 1916, the Johannessens were spending their summers in a rented house in Asker, a rural area just outside Oslo which was already popular with artists including Harriet Backer. It kept them close to their friends, such as the poet Kristofer Uppdal. Aksel Waldemar Johannessen (1880–1922), Rain (1915-16), oil on canvas, 68 × 80 cm, Private collection. Wikimedia Commons. 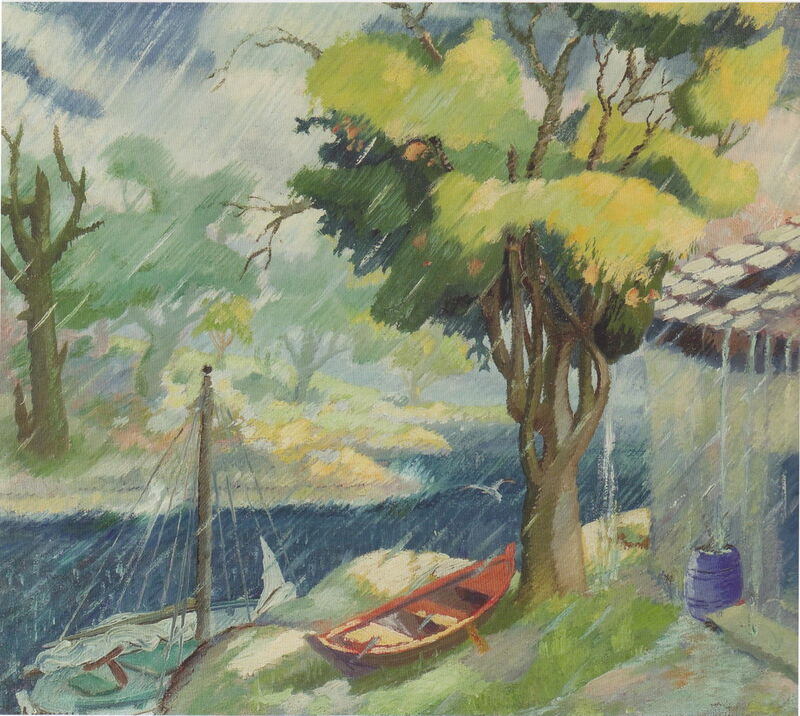 Rain (1915-16) is an evocative painting of a thoroughly wet day there. Asker is on the bank of Oslo Fjord, and ideal for family coastal sailing, and walking. Aksel Waldemar Johannessen (1880–1922), Landøen in Asker (1916), oil on canvas, 82 × 96 cm, Private collection. Wikimedia Commons. 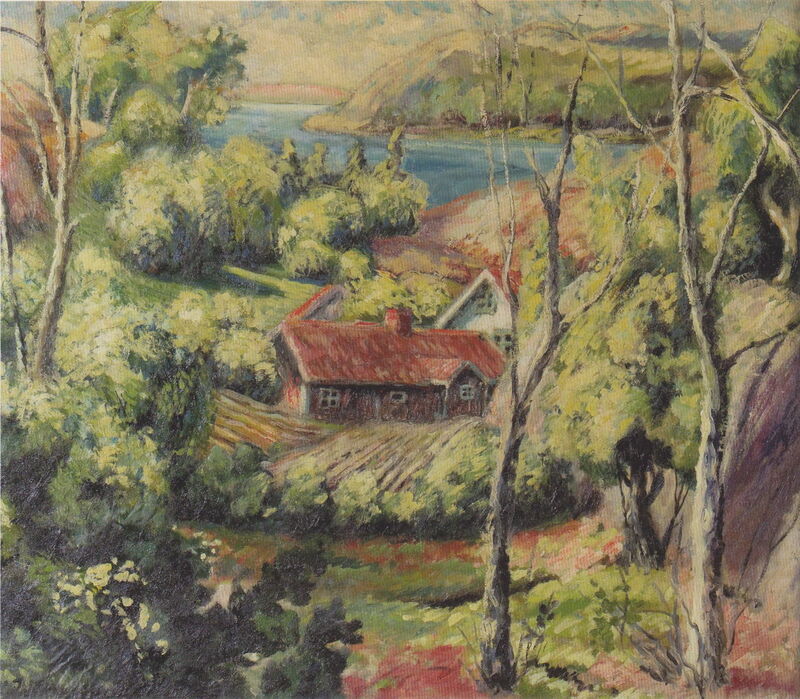 Landøen in Asker (1916) is a view of part of the dissected coastline near Asker. Aksel Waldemar Johannessen (1880–1922), The Artist’s Summer House in Asker (1916), oil on canvas, 98 × 84 cm, Private collection. Wikimedia Commons. 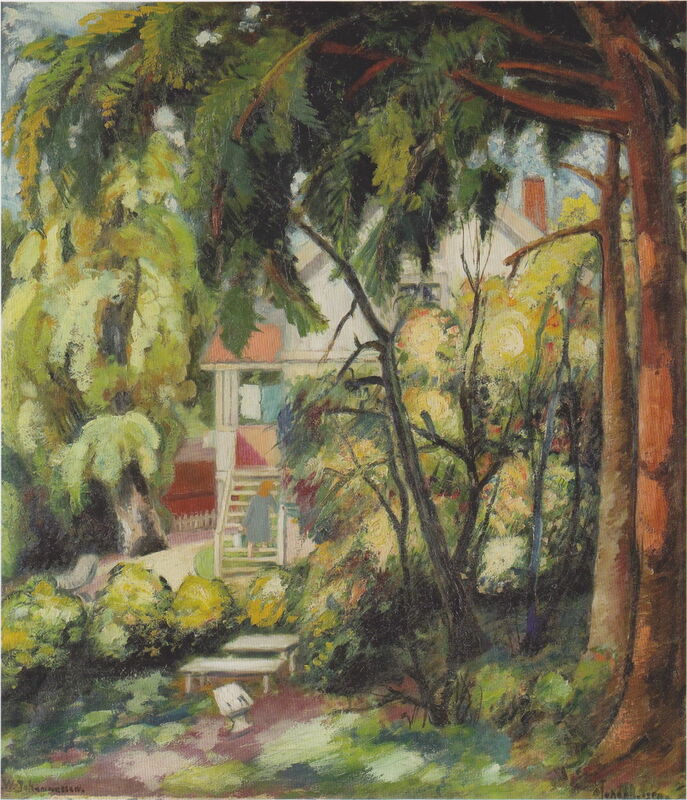 The Artist’s Summer House in Asker (1916) shows their rented property, with Anna Johannessen making her way up its steps. Back in the city of Oslo, Johannessen painted colourful street scenes, such as this Market Scene from about 1916. Aksel Waldemar Johannessen (1880–1922), The Drinker’s Family (1916), oil on canvas, 115 × 135 cm, Private collection. Wikimedia Commons. As with Edvard Munch and so many other artists, Johannessen was prone to bouts of heavy drinking. 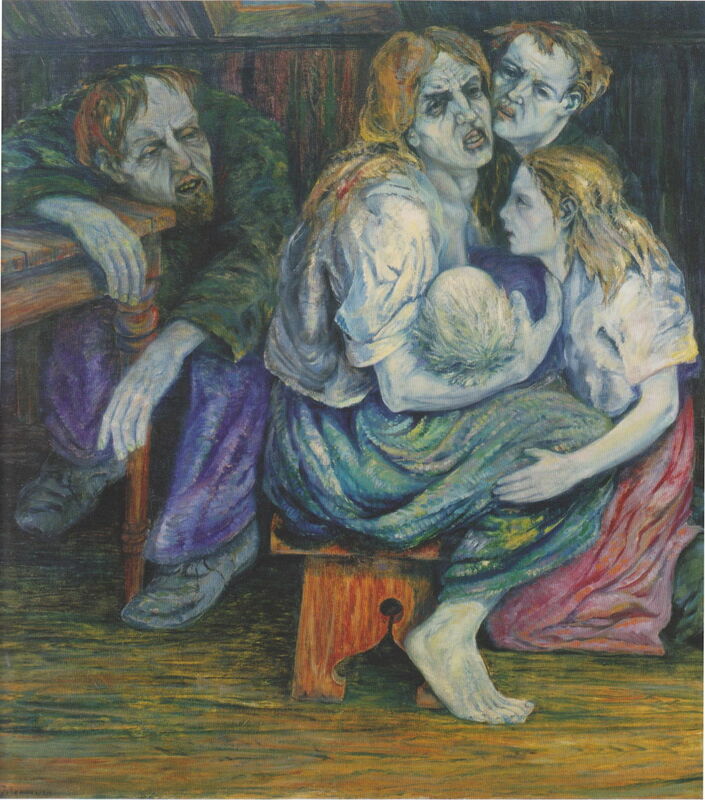 In The Drinker’s Family from 1916, perhaps painted during a period of remorse over his drinking, the artist here includes two self-portraits, as the young man at the right, and the wrecked alcoholic at the left. Aksel Waldemar Johannessen (1880–1922), The Morning After (1916), oil on canvas, 77 × 89 cm, Private collection. Wikimedia Commons. 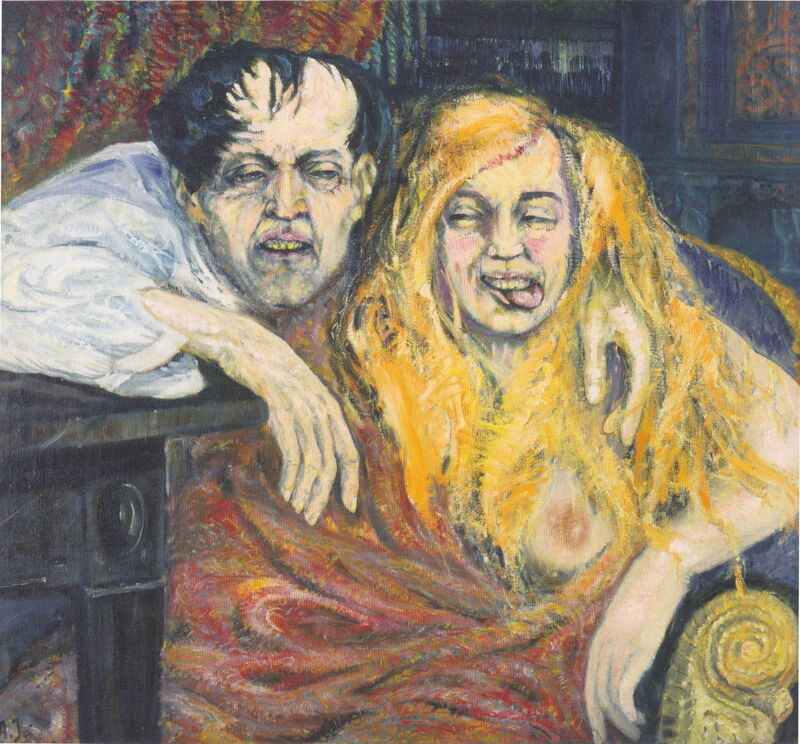 The Morning After (1916) is another self-portrait as a drunkard, his arm around a woman who pokes her tongue out in disapproval of his addiction. Ich liebe diesen Blog! Wisst Ihr was? Ich werde ihn öfter mal rebloggen.